Greenburger's is a restaurant located in the Lower Haight, not a neighborhood I frequent often, so even though it has been there for a few years, it was new to me. Anyway, I was thinking about burgers, and somehow wound up on Yelp, reading about burger places. (Does this happen to you? Late at night, long after you should have gone to bed, you get lost on Yelp or Wikipedia? Yeah, totally my weakness!) I was intrigued by Greenburger's. Yes, they offer burgers, but I would not call it a burger joint. It is almost more of a soda fountain or diner, except, not at all decorated like either of those types of places. And ... totally not a greasy spoon. They serve classic comfort food, but focus on using locally owned, eco-friendly products. Greenburger's is one of the most unique places I've visited in San Francisco, and I'm eager to return. Vendors: all local and eco-friendly. On each table is a card showcasing the vendors they work with. It provides the basis for the restaurant: free-range, hormone-free, organic, sustainable, local, etc. The most surprising item on here was the soap. Yes, the soap. 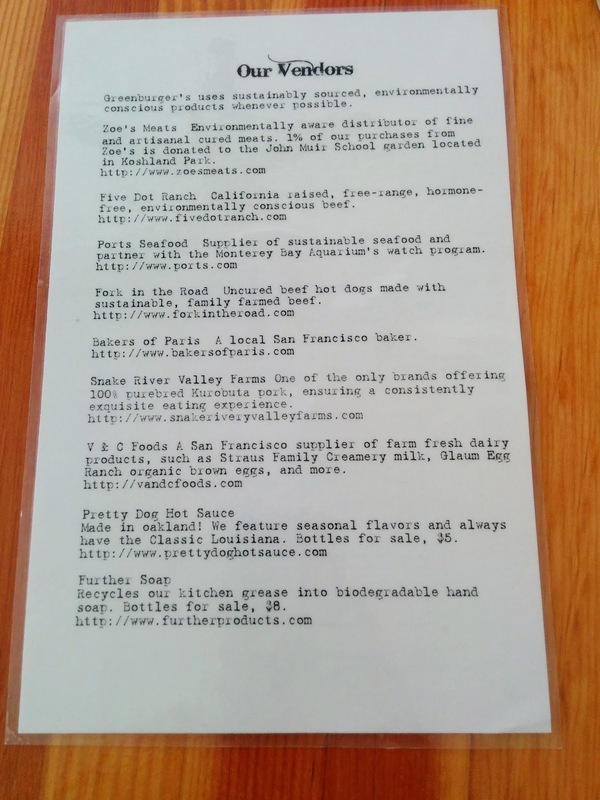 The vendor they work with, Further Soap, "recycles our kitchen grease into biodegradable hand soap, and sends it back to us to use in the restaurant". When I used the bathroom, indeed, the soap was labeled as being from Further Soap. A lot of establishments in San Francisco do the trendy thing of mentioning their vendor's names, or throwing in organic labels, but Greenbuger's really does seem to stand by this. It shows also in the way they handle their condiment station. Since the menu does feature quite a few burgers and sandwiches, and things you'd dip in sauces, there is a condiment station, full of their own housemade sauces. That part was nice, but not particularly novel. The condiment station also includes all the standard burger toppings: lettuce, tomatoes, pickles, etc. I've never seen this done before. Most places include them on your platter. Greenburger's realizes that this is a big source of waste, because people throw them out all the time. (Side benefit: people like me, who love adding a slew of pickles, also win, as we can put on as many as we want, without having to scavenge from our pickle-hating dining companions). As I mentioned, Greenburger's is almost like a diner or soda fountain, but not in decor. It is a casual place, where you order at a register, and are given a number, which you take back to your seat with you. Orders are delivered individually to you directly from the kitchen, from someone wearing chef's coat, rather than a dedicated food runner. I thought that was a nice touch. The staff were all very friendly, from the person taking my order, to the person who delivered my food. The staff who brought out meals always remembered to point people to the condiments station, instructing them to take whatever they needed. Along with the aforementioned condiments, the station also contained the silverware and self-serve ice water. The feel of Greenburger's was certainly unique. Like I mentioned, you order at a register, but, it almost felt like there was full table service, as the people bringing orders out would stop by other tables to check in on people, and someone noticed when I finished and cleared my plate away. It was not self-bussing. I really liked this mix of casual but attentive. The menu, at first glance, is not unique at all. It reads like a diner menu, full of American classics, all comfort foods, all crowd pleasers. I am quite certain that there is something for absolutely anyone here. As you would expect, there are burgers of course (made with sustainable beef or lamb) and sandwiches (pulled pork, turkey club, chicken cobb, fried fish). And all your classic sides: wings, slaw, mac and cheese, mashed potatoes and gravy, fries, sweet potato fries, onion strings, cornbread, salads. The other section of the menu contains the (non-sandwich) entrees, crowd pleasers like fish and chips, meatball parmesan over spaghetti, and grilled chicken. Daily specials include fried chicken or bacon wrapped meatloaf. All classics, but they throw a curveball in with the incredibly interesting sounding Fried Thanksgiving Dinner, "panko crusted balls of turkey, mashed potatoes, and stuffing, served with gravy, seasonal veggies, and homemade cranberry sauce". I don't like turkey, but something about this sounds pretty amazing. Being a San Francisco establishment, vegetarians and vegans are well catered for, with housemade organic veggie burgers, vegan sloppy joes, and "chicken fried tempeh". Even kids can eat here, with a menu showcasing hot dogs, grilled cheese, and mac and cheese. And then ... desserts. A separate area behind the registers houses the dessert preparation station, featuring Straus organic ice cream, made into decadent sundaes and milkshakes, or served atop housemade pies and bread pudding. The milkshakes in particular looked legit, made to order, served in a classic milkshake cup, with the extra delivered in the metal mixing cup alongside. The best part? Sundaes or shakes are available in half sizes, so you can easily add one on to your meal. I was there for brunch, where the menu is again full of the classics: breakfast sandwiches, eggs benedict, scrambles, eggs any style, pancakes, french toast. The curveball here seemed to be the hash, buffalo chicken style: "pulled chicken, sautéed onions, bell peppers, and Yukon gold potatoes tossed in buffalo wing sauce, served with 2 eggs any style and bleu cheese dressing on the side". The menu for Greenburger's seemed just as unique as the style of the establishment. At first glance, simple, but I like how they focus the menu on the crowd pleasers, classic diner-style food, but then throw in an interesting dish on each menu, and, I assure you, the food is not diner-style at all. Classic French Toast (child size). $3.50. I love breakfast foods like french toast and pancakes. But, I don't actually enjoy eating an entire loaf of bread as a single order of french toast, or a stack of pancakes so high it topples over, for a simple breakfast. Sure, there is a time and a place for that, but on a regular day, I prefer to eat a smaller portion, and then enjoy another meal soon after. But when is the last time a restaurant served a reasonable portion? The regular menu listed both the french toast and pancakes for $8.50, but I noticed that the kids menu had smaller orders available. I wasn't trying to be cheap, I just wanted a smaller portion. Most kids menus have very aggressive messaging: "UNDER 12 YEARS ONLY", or the like. Greenburger's did not. I'd also noticed that under the desserts section, it said they could all be made half-size for half-price. I thought there was a chance that perhaps this was the sort of place that wanted to actually please its customers, rather than forcing them to be gluttons, waste food, or split meals. I sheepishly asked if I was allowed to order off the kids menu. The guy taking my order said, "of course!" So refreshing and much appreciated. I personally have a huge problem with food waste, so this is often a source of angst for me when I'm dining alone, since I can't just split with someone, and I'm forced to either waste food, or stuff myself. I was so happy to be able to just order a child's size. I was completely torn between the Classic French Toast or the Buckwheat Blueberry Pancakes. I asked the guy taking my order which he recommended, and he said he hadn't had either. Since I'm more picky with french toast, I was about to order the pancakes, when he said, "I think you feel like the french toast". So, I agreed. The regular menu said the french toast and pancakes were both served with seasonal fruit and organic maple syrup, but the children's menu did not, and, given the price, I assumed I was getting a very basic offering. I was thus delighted when my order arrived, and wasn't just a lone slice of french toast. It looked great. The french toast lived up to its name of "classic". To me, classic mostly means that it will be dunked in an egg batter, slightly spiced with cinnamon, topped with powdered sugar, and served with little else. There can be a fair amount of variance even in classic french toast, based on the type of bread used. Greenburger's used thick cut brioche, a much better choice than the white sandwich bread version from Soma Inn Cafe or the wheat sandwich bread version from Sausalito Cafe, and they did a better job with the brioche than Axis Cafe. However, the french toast itself was highly unremarkable. It wasn't too eggy, and I think it had a slight cinnamon spicing, but it was hard to tell given the other toppings. It wasn't overcooked, or burnt, or anything, fairly moist. It was clearly made to order, delivered hot and fresh. But again, very standard, unremarkable. In terms of bread choice, the most memorable I've ever had is from Lou's Cafe, in my hometown in NH, that makes theirs from ... glazed crullers (yes, the donuts). A serving of their french toast is literally, three full size glazed crullers, dipped into french toast batter, grilled, topped with fruit and whipped cream, served with syrup, and a side of bacon fat fried homefries. Oh my. But back to Greenburger's version. It looked beautiful, due to the toppings. Toppings are always a crucial aspect of french toast. A truly classic version would just be sprinkled with powdered sugar and served with syrup, which this was, but it was also garnished with fresh blackberries, and covered in a berry sauce. I always like powdered sugar on french toast, so that was a good touch. The blackberries were plump, juicy, and tart. I don't love blackberries (I can't stand the seeds), but these were clearly a quality product. The description said it was served with seasonal fruit, which the blackberries certainly were. It didn't say anything about the sauce, but honestly, it looked great, so I eagerly dug in. Unfortunately, the sauce totally ruined it for me. It was very, very sweet, and I just didn't care for the flavor. 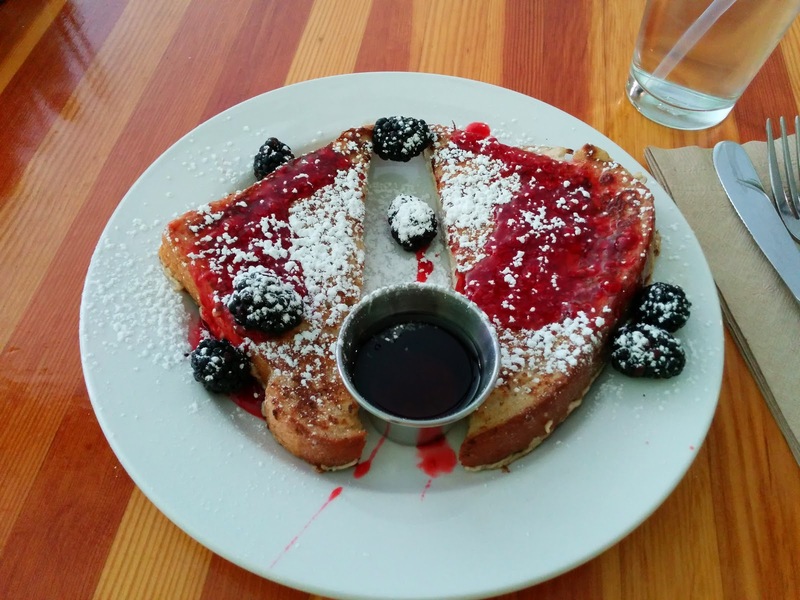 French toast slathered in berry sauce can totally be delicious, but in this case, it really was the downfall. Served on the side was a little pot of maple syrup, the real stuff, organic even. Unfortunately, since the french toast was absolutely covered in the berry sauce, it was impossible to use much of the maple syrup, as the berry sauce was cloyingly sweet on its own. I scraped off as much as I could, and dunked the unspoiled edge pieces in the maple syrup and enjoyed them, but the berry sauce just killed this dish for me. I was very glad I didn't get the bigger portion. The best french toast I've had to date is the brioche french toast bread pudding with stewed apples and quince, crème fraîche whipped cream, and candied pecans at Baker & Banker, although, calling that "french toast" isn't quite fair, as it really is french toast + bread pudding + pie, all in one. And really, more of a dessert than a breakfast or brunch item. While I was dining, I saw a child next to me get the buckwheat blueberry pancake. A huge pancake, loaded with blueberries, garnished with more blueberries. No blackberries nor berry sauce in sight. I was highly regretful of my decision to get the french toast. But to be fair, this was classic french toast, executed well, and if you liked the berry sauce, I'm sure it was good. The $3.50 price tag was insanely good, for a full piece of french toast, plus fresh (probably local and organic) berries, plus real organic maple syrup? Some places will charge you $2 just for the syrup. I'll be returning, but I will most certainly go for the pancakes next time. Or, I'll go for lunch, since the fish and chips is also calling out me, as are pretty much all of the side dishes! As you know, I recently took a business trip to Tokyo. Some parts didn't go exactly as expected, thus, I wound up on a Cathay Pacific flight to Hong Kong, rather than a direct flight to Tokyo on JAL. It added some frustration, and a lot of hours, to my flight, but, I got to experience Cathay finallyThe aircraft used for my next segment, Hong Kong to Tokyo, was basically the same as the one on my San Francisco to Hong Kong segment, so I'll skip all the basic details here. The only major difference was that it was now a daytime (morning) flight rather than overnight, so I didn't turn it into a bed for sleep. Back view of my seat. Same seat, with large tv screen. The only difference this time is that the flower vase actually had a flower in it. It was strangely empty on the previous flight. Same controls, power outlets, usb chargers, cubby for the headphones, side table that then turned into dining table. Meal service was another breakfast, although with slightly different options this time. The service was very slow. Business class was not full, and I think due to the low load, they did not do dual service as they did on my previous flight, so it took a while for the single attendant to serve everyone. The breakfast menu again began with a slew of light starters: fruit, yogurt, cereals, along with juices. Breakfast Starter #1: Fresh Seasonal Fruit. The first offering was a fresh fruit platter. 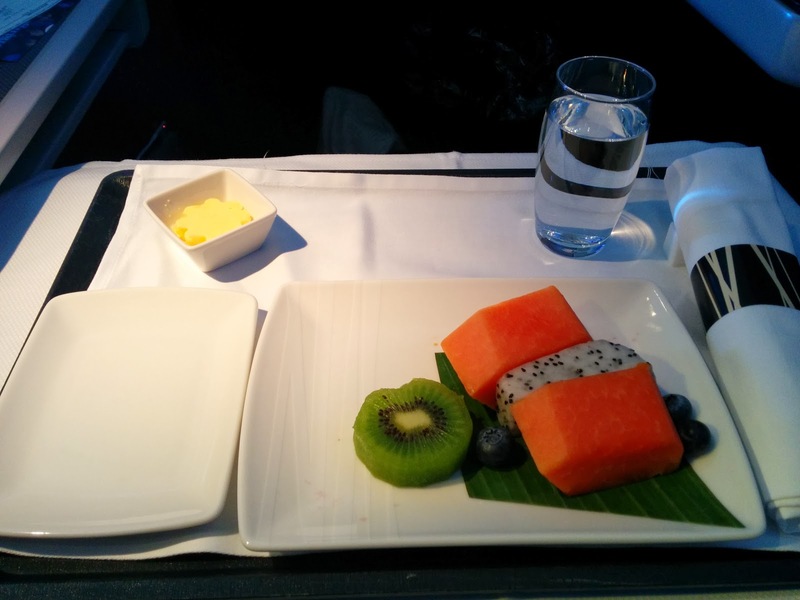 I have never been able to have a fruit platter on a flight before, as they always contain melon, and I'm allergic to melon. I was excited to finally be able to have one. I was really impressed with the fruit selection. Kiwi, papaya, blueberries, and dragon fruit? A major step up from the usual melons, grapes, and pineapples. The fruit was all quite decent, fresh tasting, served cold. The papaya was my favorite. I would have appreciated more than just 3 blueberries. This was shocking good for airplane fruit, and I'd get it again. Breakfast Starter #2: Banana muffin with butter. Next came the breakfast bread basket. This time I had the choice of a banana muffin, a croissant, or a roll. 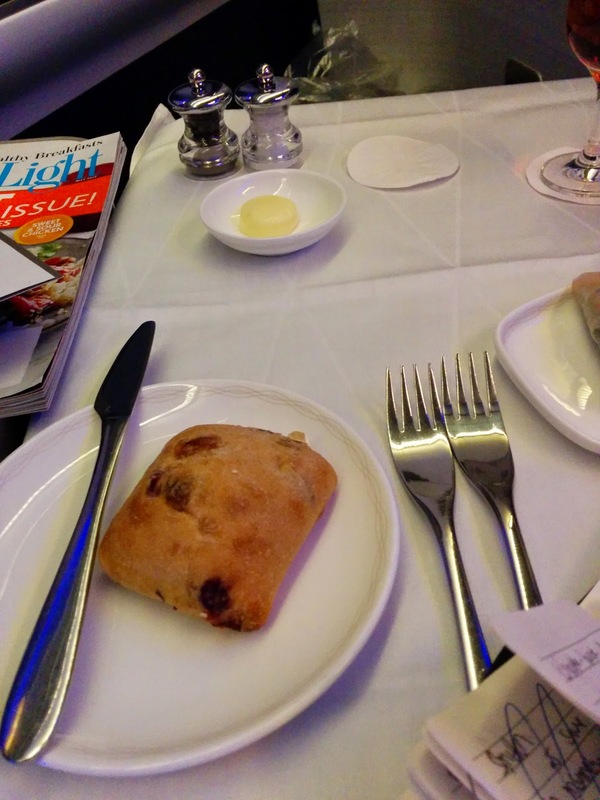 Not really that much more exciting than the last flight, but this time the breads were actually served warm. I still think they probably were supposed to be on the previous flight? 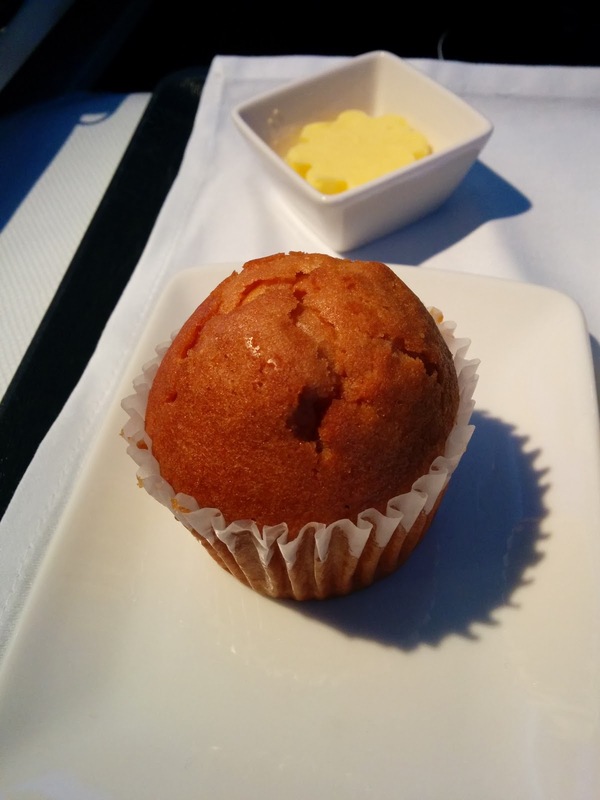 I appreciated the warm muffin, and it had a nice strong banana flavor, and it was moist, but ... I just didn't like it very much. The croissants looked better in this basket than the previous one. Breakfast Starter #3: Muesli with milk. Next up was a selection of yogurts and cereals. The cereal selection again contained Special K, but this time there was also corn flakes, and muesli replaced the granola. On the previous flight, I opted for the granola, but with yogurt on the side, to make it into a parfait. It didn't work well, since the yogurt was way too sweet. This time, the yogurt choices were strawberry, apricot, or blueberry, so I decided to just opt for milk, assuming the yogurt would be equally too sweet. The milk was absolutely delicious. It tasted like cream, honestly. I feel silly raving about milk, but wow, this was good milk. When the attendant poured it into my cereal I was a bit annoyed at first because she added so much more milk than cereal, and my granola was absolutely swimming in it, but in the end, I loved the milk so much that I drank it all up, and it was even better once a little bit of the sweetness from the granola infused it. Yum! The muesli was oat based, fairly generic, but loaded up with all sorts of stuff. There were several types of dried fruit, bits of apricot, raisins, and dates, all of which added a bit of chew and pleasant sweetness. There were also assorted nuts, almonds, cashews, and hazelnuts. The hazelnuts were a bit too bitter, but I was intrigued by the fact that they floated. Did you know hazelnuts float? This was fine, but I'm not much of a cereal person in general. That milk though ... so good, that I'd get this again. Breakfast Main: Dim sum with chili sauce. And for my main course, I went for the dim sum. 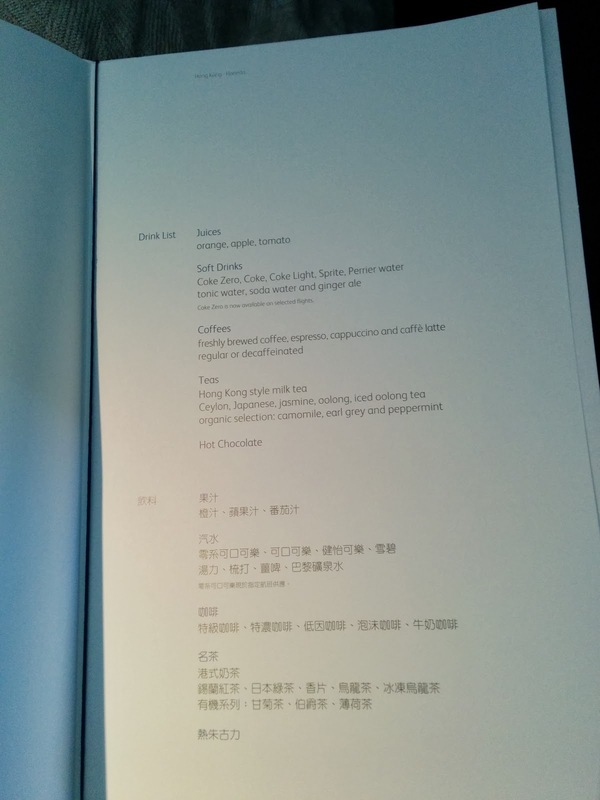 On my previous flight, the dim sum had looked so much better than my selection, and, I was flying out of Hong Kong, so it seemed like the fitting choice. Plus, well, I don't like omelets or beef curry anyway. The description of my dim sum platter read: "pork sui mai with scallop, shrimp dumpling, pork and chive dumpling, mini chicken glutinous rice wrapped in lotus leaf". I tried them in the order by which they interested me. I was most excited for the sui mai with scallop, since I love scallops. But alas, there was no scallop, it had shrimp instead. Next I moved on to the shrimp dumpling, my second choice. It was slimy. The wrapper was flimsy. And, as I cut into it, water came pouring out. It was not very good. Then I tried the final dumpling, pork and chive. The wrapper on this one was actually good, a bit chewy, but the filling was way too porky for me. I don't like pork. And finally, the lotus leaf. I do like glutinous rice, but I dislike chicken. Luckily for me, there was more than just chicken inside, I also found sausage, mushroom, and other random unidentifiable bits. I didn't really like any of this, and I was glad I'd had the fruit and cereal, along with a few treats from the lounge during my stopover. 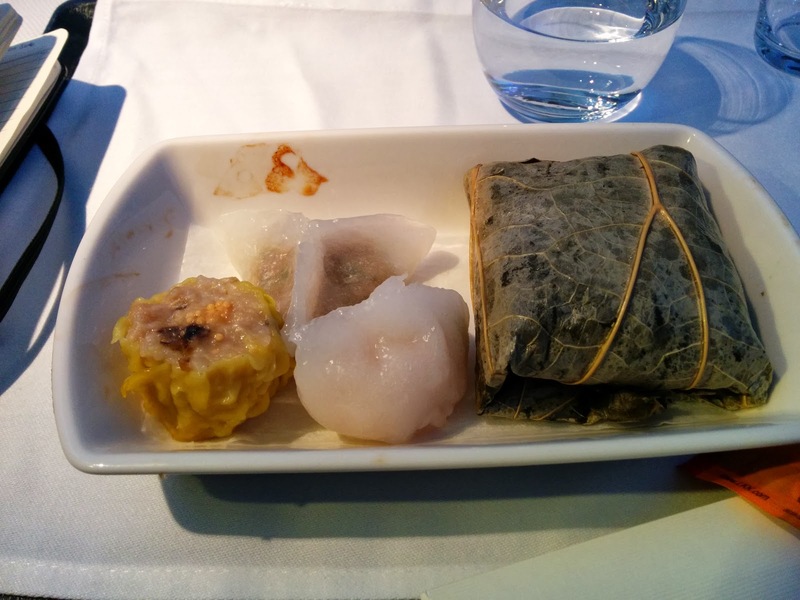 It sorta makes sense that dim sum can't be good on an airplane, but I was really disappointed by this, since I know Cathay always serves a dim sum choice, I assumed they'd figured out some way to make it decent. My travel companion selected the omelette, and he enjoyed it, in particular, the full sausage that came with it. As I mentioned last Monday, I recently took a trip to the island of Mallorca, of the coast of Spain. I'll get to reviewing all the cuisine on the island soon enough, but to start, we needed to actually get there. We flew to Mallorca from Barcelona, via London. I flew with my friend Emil, who flies a lot with British Airways, so, I was welcomed into his world via a companion upgrade certificate. 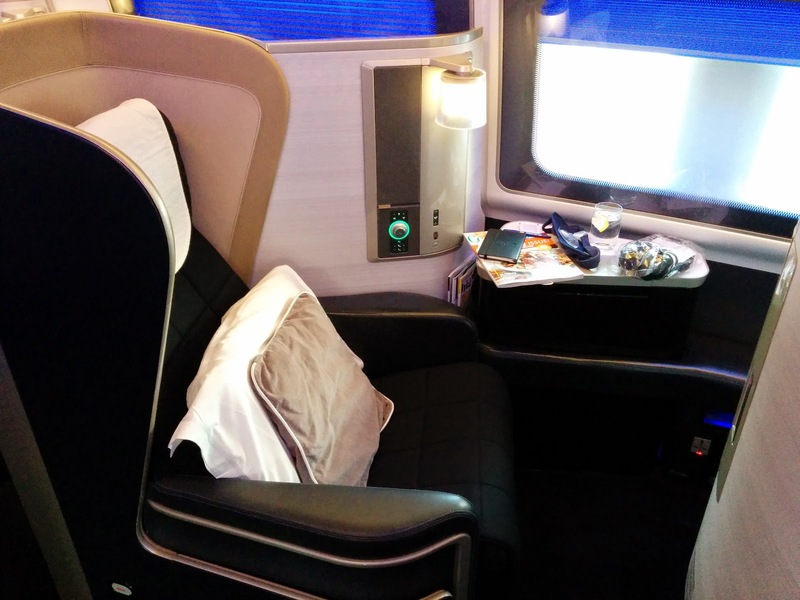 My first time flying with BA, and I flew First Class no less. I was thrilled to get to see what flying was like from his perspective. Since I've reviewed them before, I'll skip the details of the One World Lounges in SFO. 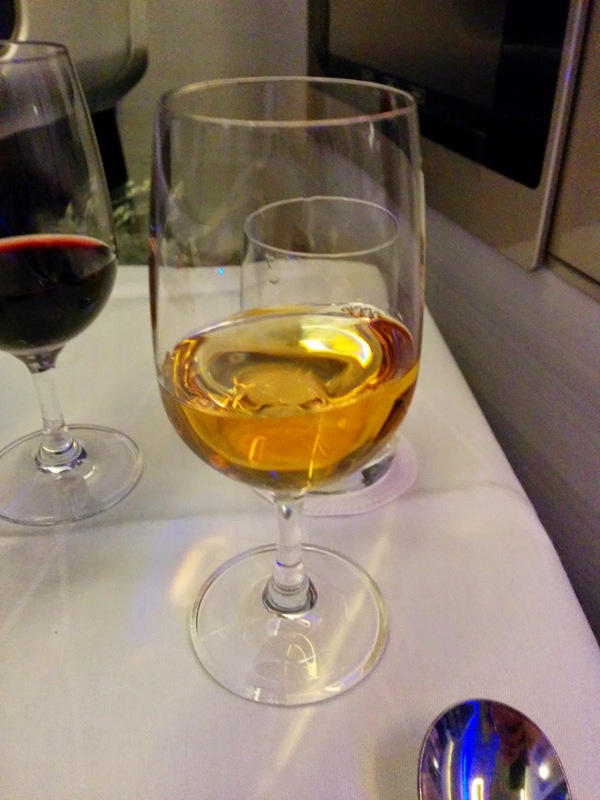 We spent all our time in the First Class section of the BA lounge, and, it was exactly the same as last time - mediocre sandwiches, soups, and snack foods, a nice selection of alcohol. To start our journey, we were invited to board the flight via “the library”, in the back of the business part section of the lounge. This was quite novel, but I admit it was really nice to not need to exit and go back out into the chaos of the main terminal. The calmest boarding experience I’ve ever had. 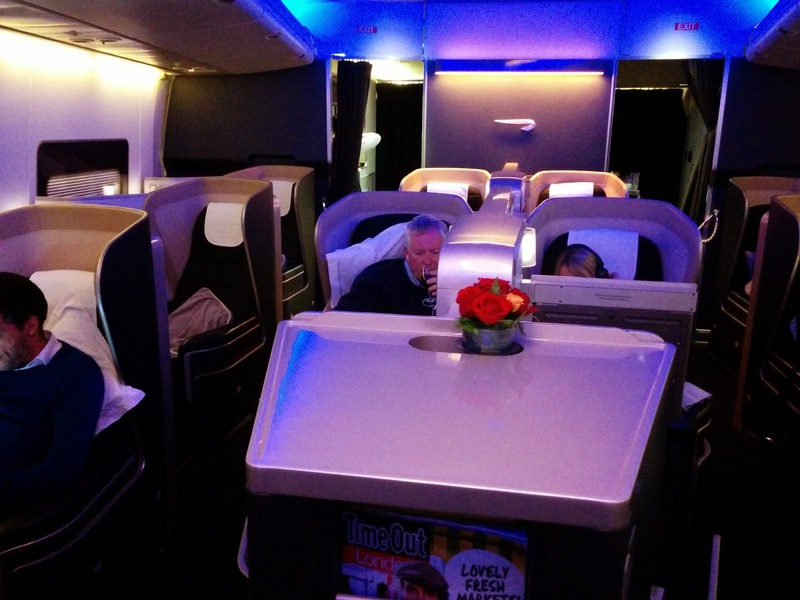 I was flying with Emil in first class, but we had two colleagues flying with us in business class (Club World). We had our boarding passes scanned in the library, and I walked down towards the plane with Levi, who was seated in Club World. I somehow missed the “exit” to the First Class boarding door, and was surprised when we hit a long line of people, including babies and strollers. I looked back, and Emil was no where to be seen. Whoops. I’m not sure if I was just really not paying attention, or they saw Levi and I and assumed that we couldn’t possibly belong in first class? I sheepishly presented my boarding pass when I finally got to the plane, and said, “uh, I think I missed my exit?” The friendly flight attended laughed and welcomed me to take the scenic route to my seat. She lead me through business class and to my seat, and made a comment about how I did it on purpose just to get to meet more staff. I appreciated her fun attitude. Once I finally reached my seat, it was time to explore. Guest Seat with slippers, socks, etc. Waiting for me at the seat was a pair of slippers, socks, eye mask, ear plugs, a thin blanket, and a pair of pillows (a large white one and a smaller grey one). Within a few moments, an attendant came by with a tray of amenity kits. She only had men’s kits with her, but promptly returned with a women’s version. 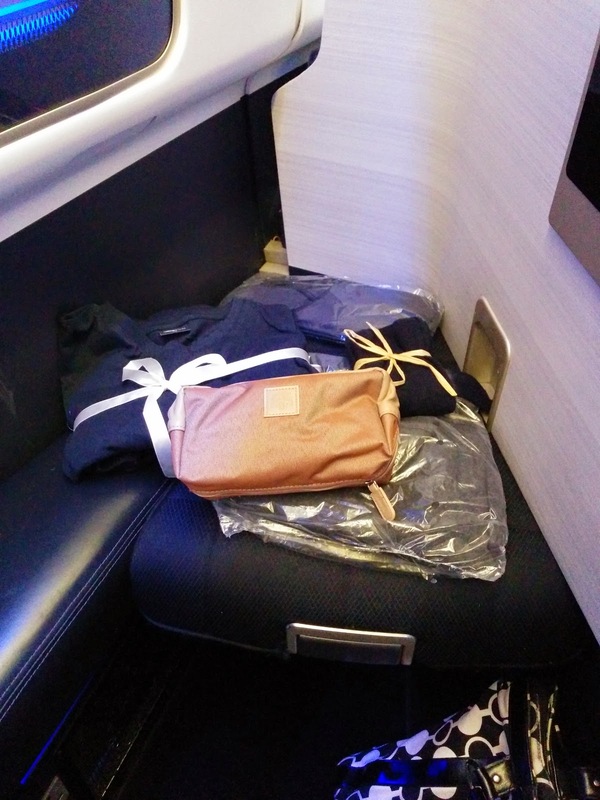 Guest seat with pajamas and amenity kit. Inside my kit was lip balm, eye firming lotion, regular lotion, toothbrush & toothpaste, a foldable brush/mirror, a deodorant stick, and cotton pads. Quite extensive, and there was nothing I was lacking. She also had a tray of pajamas, sized M and L. After taking one look at me, she offered to go find me a S. I was quite thrilled to be given pajamas that actually fit. The pajamas were simple, cotton, drawstring waist pant and long sleeve t-shirt. Comfortable enough, but not fancy, about on par with the ones I received in Premium Economy aboard Qantas. 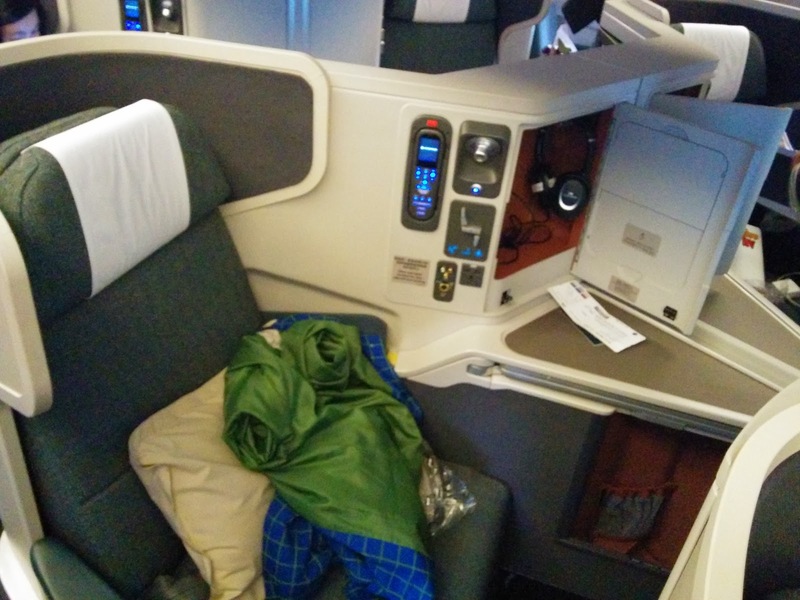 The Cathay Pacific First Class sleeping suit is much, much nicer, with pockets in the pants, and a button down top, although, comfort-wise, I may have preferred the simple long sleeve t-shirt. After taking in the amenities, it was time to examine my seat. 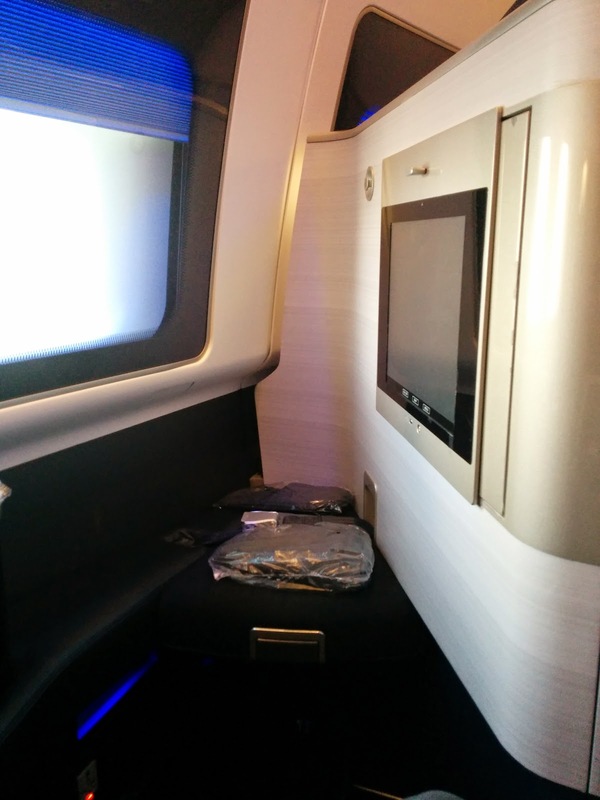 We were in BA’s “new First”, so the seat was relatively new and modern. Along with the airline magazines was a card describing how my seat operated, quite handy, and I wish more airlines did this, as the controls are generally less than obvious. The seat was comfortable enough sitting up, and adjusted via a knob. The knob felt much more intuitive to control than the more common seats with multiple buttons to control the seat motion. There were separate upper and lower lumbar controls. I did wish the foot rest was independent though, as I like to be able to put my feet up. The seat was not nearly as wide as the Cathay Pacific First Class seat, but was plenty wide enough for me while seated. Above the controls was a cute little lamp. It provided light that wasn’t direct and glaring, and really gave a totally different effect due to its real lamp-like nature. Points for this. Speaking of light, each seat contained two windows, and the blinds for those were controlled electronically. I would have never figured out this control had it not been for the card that described my seat, but it was quite handy to be able to so easily put the blinds up and down. The final component of this area was my side table, where I could put things during the flight, but not during takeoff or landing. Across from me was an ottoman, which could be used by a dining companion during meal service, and turned into the foot of the bed for sleep. 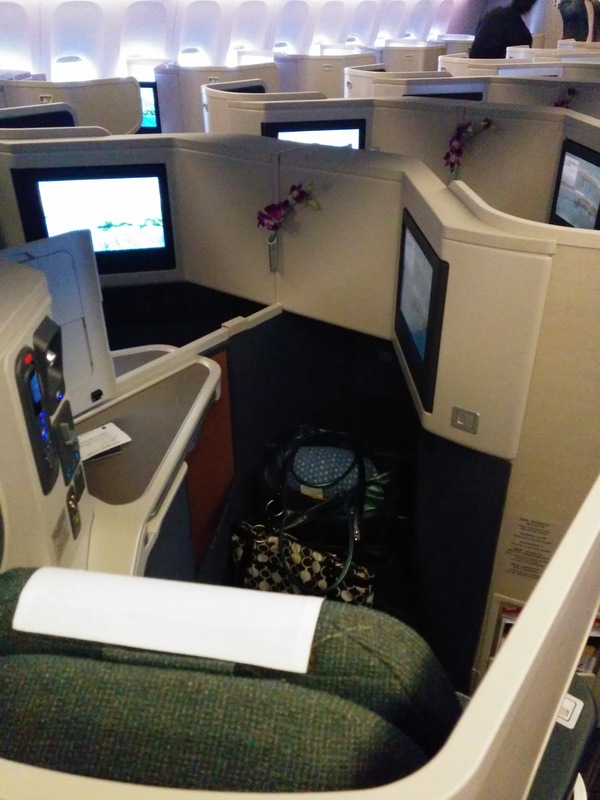 Unlike Cathay, it was not suitable for storage underneath during takeoff or landing, which made me a bit grumpy, since I am constantly going in and out of my bags, and like to have them easily accessible. Above that was a large TV screen with movies I actually wanted to see, but, given the timing of the flight, I didn’t ever end up even turing it on, nor checking out the headphones that accompanied it. Directly to the side was a closet, with a hanger, pockets, and a shoe cubby. It was sufficient to store my shoes in the cubby, and my jacket on the hanger, but little else. I preferred the Cathay one which was far deeper, and able to store my clothing once I changed into my sleeping clothes. Overall, the seat was fine, but the Cathay one excelled in terms of actual usability, particularly the storage space. 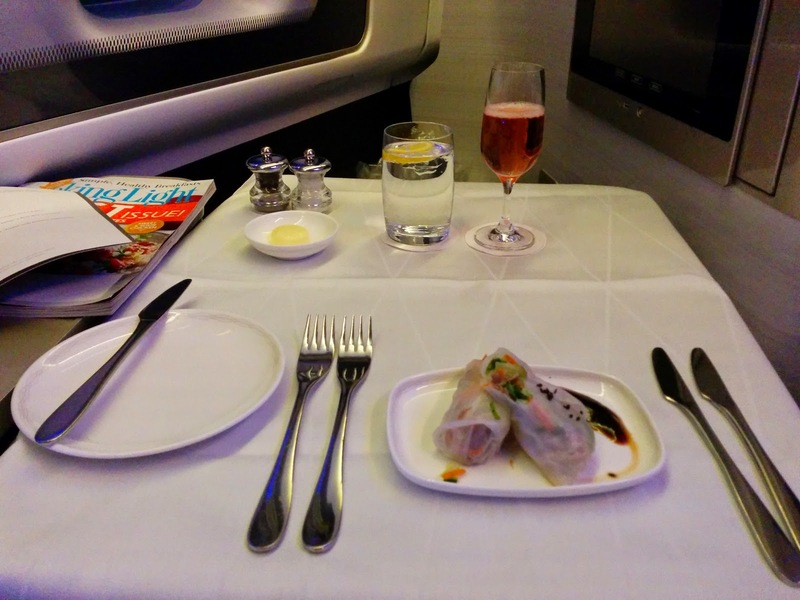 Throughout my flight I struggled with having no place to tuck belongings, particularly simple things like a water bottle, which was something Cathay seemed to get just right, even in business class. The first class cabin had a really nice feel, it was far more spacious than Cathay, located in the nose of the plane. The seats were arranged with 5 each along the windows, and then two extra pairs in the widest part in the middle. It did not feel like the seats were crammed in at all, and there was plenty of space to move around. Once we got underway, the menus were brought out. 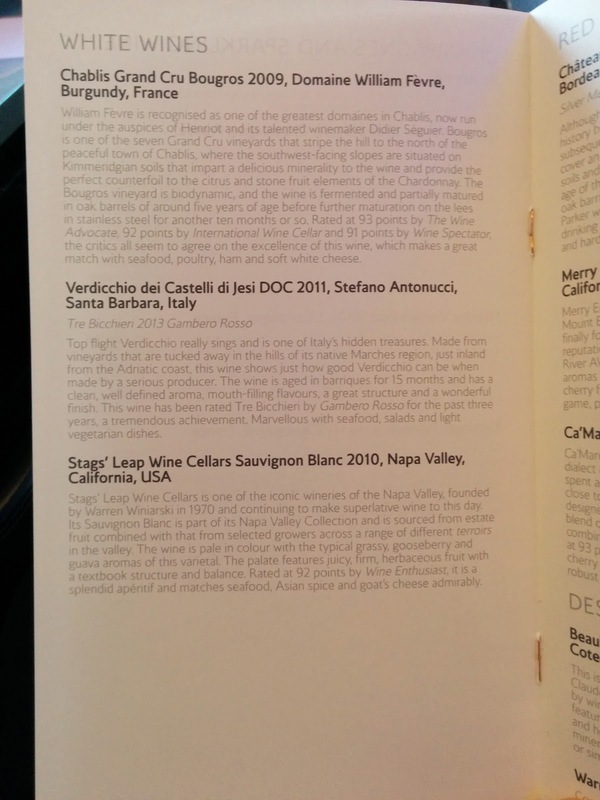 The first few pages held the alcohol selection, encompassing several pages, including a bar menu, champagnes (3 varieties, include rose), white wines (3), reds wines (4), and dessert wines (2), followed by the dinner and breakfast menus. I was informed that I could dine any time I’d like, including just getting a quick continental breakfast to maximize my sleep time. I asked to start my meal as soon as possible, since it was already almost 8:30pm (our flight was slightly delayed), and I normally eat dinner at 6pm. I knew the full dinner service would take some time. I asked his advice, and he told me to start with both the rosé and a Kir Royale. I had my eye on some wines to pair with my meal, so I certainly didn’t want two champagnes to start, so I decided to go for the Kir Royale, as it was more novel than the rosé. 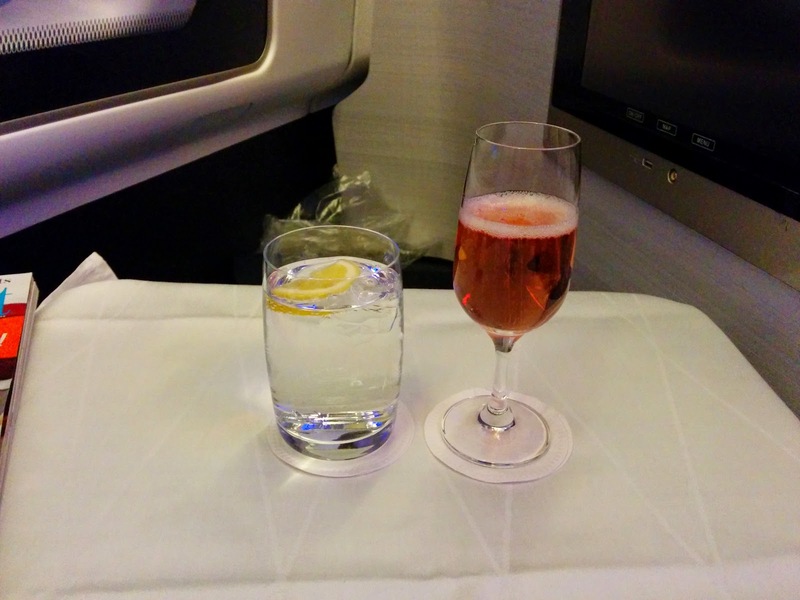 The Kir Royal is a BA tradition, so I went for it. I was delighted when the drink arrived with nuts on the side. Sure, most airlines give you nuts. But these were not just any nuts, they were warm nuts. But of course, even American Airlines domestic flights give you warm nuts. What made these exceptional was the fact that some of them were candied. The mix contained candied cashews and macadamias, along with plain hazelnuts and almonds, an even distribution of all types of nuts. They did not skimp on the pricier nuts. The plain nuts were fine, but the candied ones were just delicious. Coated in sugar, crispy, and sweet. And, macadamias are one of my favorite types of nuts. Major points for BA here. These were, hands down, the best nuts I have ever had on a plane. My traveling buddy Emil felt a bit differently, as he does not like sweet things. 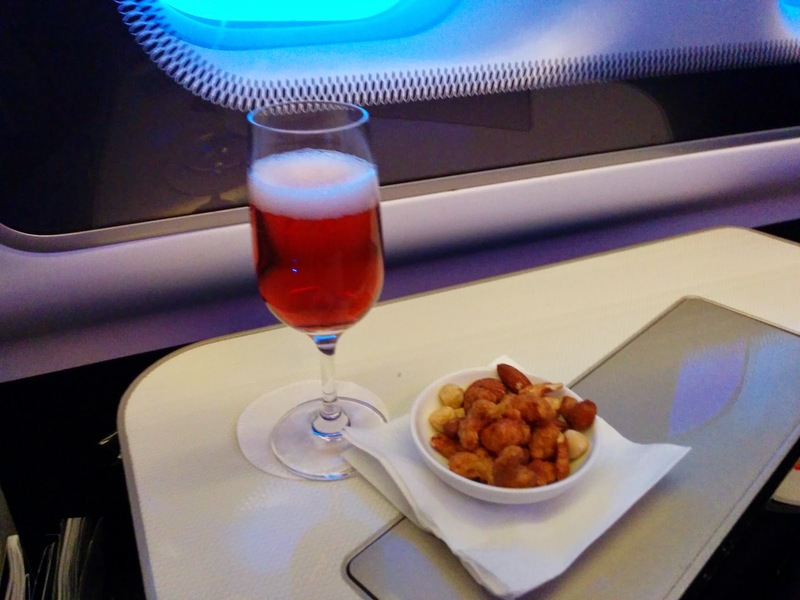 But of course, BA accommodated him, by sorting out the candied nuts and serving him only the plain ones. Seriously. The candied nuts made me really want a scotch to pair with. 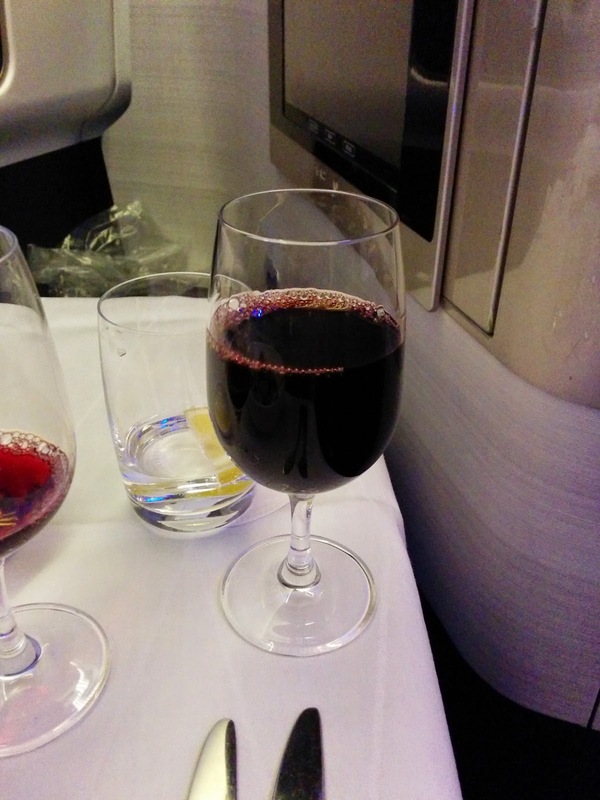 Instead, I had the Kir Royale, which, as I mentioned, I was trying because it is a BA thing. It turns out, I didn’t really like it. They used very high end champagne for the cocktail, but it was still a bit too sharp for my liking. I wouldn't get it again. 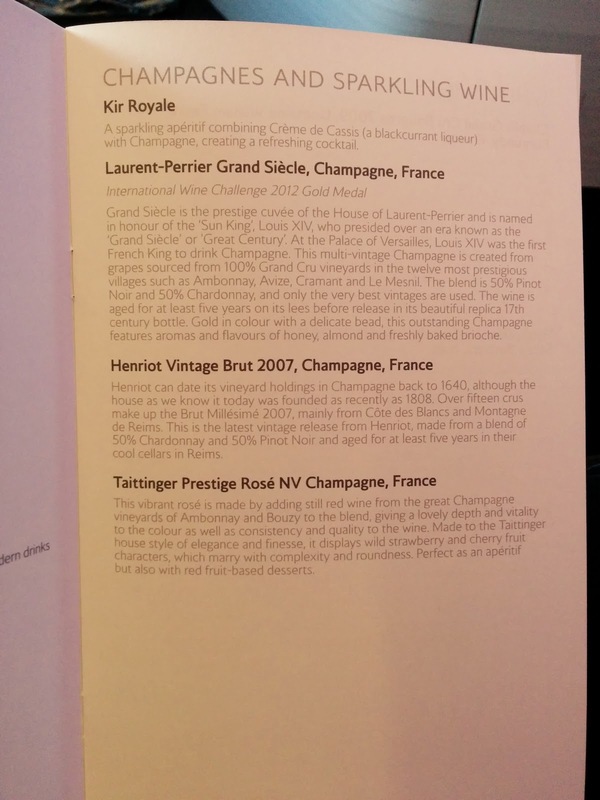 Taittinger Prestige Rosé NV Champagne. Since I didn’t really care for the Kir Royale, I decided, perhaps with a little coaxing, to move on to my next choice, the Taittinger Prestige Rosé NV Champagne. I liked this more than most champagnes, as it had a lovely floral quality to it. I laughed inside about how my rosé did indeed taste like a rose. Now it was time to make decisions about food. I had a really hard time deciding what to order, as I actually wanted many of the selections. How often do you say that on a plane? To step back a moment, this wasn't my first time seeing the menus. I like to do research before any meal, which is usually fairly easy for restaurants given Yelp!, TripAdvisor, FourSquare, etc. And, I could find plenty of trip reports discussing the particular menus that others had encountered on their flights. I knew that people generally felt that the steak was always over-cooked, and not a good choice, and that the seafood could actually be decent. But still, BA doesn't provide the menus online in advance. This made me a bit grumpy, since I wanted to prepare! 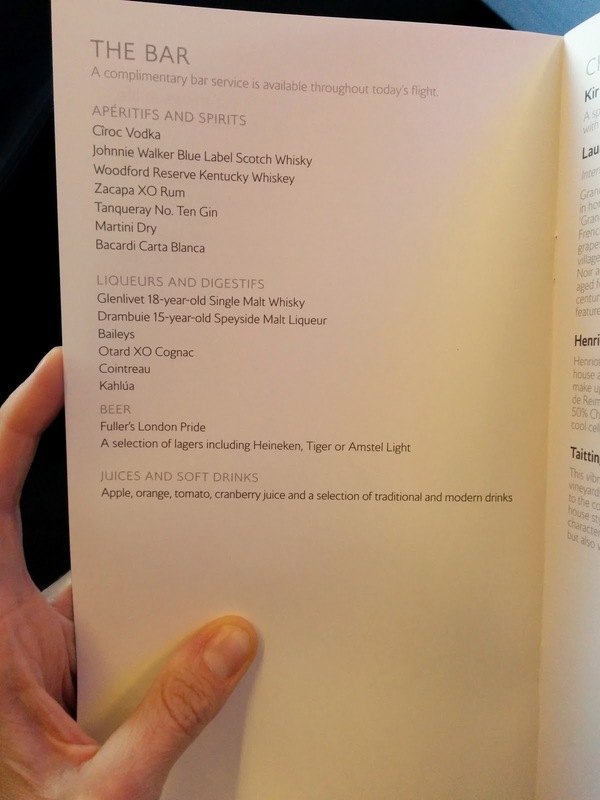 Even American Airlines provides them for domestic flights, and many competitors even allow you to choose your menu in advance to ensure your choice does not run out. Anyway, after enough research, I learned on FlyerTalk that it is possible to just e-mail (or call) YouFirst, a few weeks in advance, and ask for the menus. So I filled out the form, and magically, a few days later I had pdfs of all my flight menus in my inbox. Obviously not as nice as just providing them for everyone, but I appreciated being able to research and scheme about my options. It was still hard to decide. I would have actually eaten any of these, but I wanted to narrow it down to just one. Sure, BA would have let me order more than one, but, I didn’t want to totally stuff myself before going to sleep. The salad was the least appealing, as it was just a simple salad, so I quickly ruled it out. I’m not a huge fan of soup, but Emil says the soup on BA is always quite good, and, if I was ordering a soup, pea soup would be a top choice. Still, I ruled that out. The quinoa ravioli sounded really interesting, as I love sweet chilli sauce. I wondered what was inside the ravioli. I made a mental note to order it if I decided I didn’t like my other choices. I still have a bit of buyer’s remorse about not choosing it. That left the salmon, my top choice for the starter. I wasn’t alone, most other diners seemed to make this choice as well. Obviously, I wanted nothing to do with the chicken. The fillet actually sounded appealing to me, for some reason, the bacon grabbed my attention, as did the brandy sauce. But Emil, and many FlyerTalk posts, advised not to order steak ever, as it is always over cooked. The prawns I would have been happy with, but were not my top choice, so I also skipped those. The red snapper however sounded great. I love seafood, and Emil told me that BA always cooks the seafood well. And I’m a sauce girl, and garlic kalamata cream sounded device. And spätzle? Yes. If the menu stopped here, I certainly would have ordered the snapper. 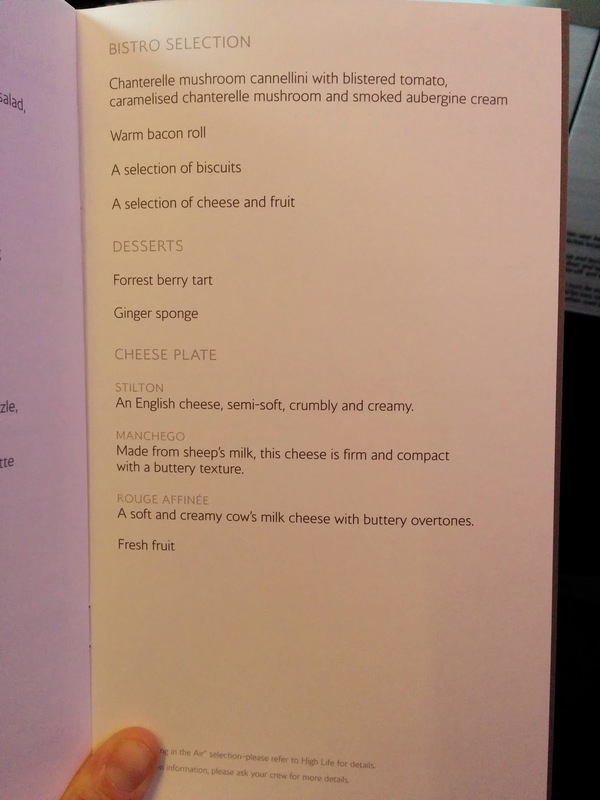 But, there was another section, the “Bistro Selection”, designed as a couple lighter options, including a fruit and cheese platter, assorted biscuits, or the famous BA bacon roll. 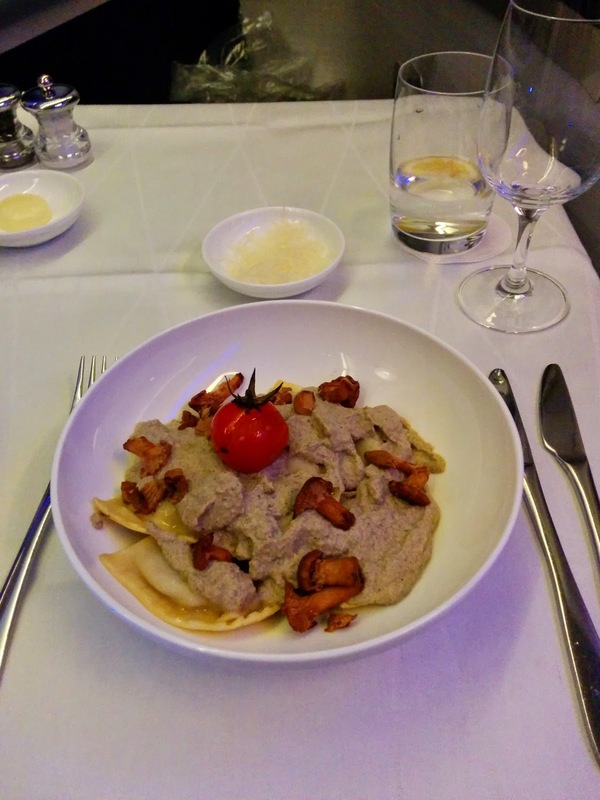 But the final item in this area was a vegetarian pasta dish: chanterelle mushroom cannellini with blistered tomato, caramelised chanterelle mushroom and smoked aubergine cream. Normally, I’d go for the seafood, but, I’ve had better experience with pasta on planes, and I’ve been craving pasta lately, so after a few agonizing minutes of indecision, I decided to go for the pasta, rather than one of the standard mains. Salmon starter and pasta ordered, I sat back to ponder the drink menu once again, to figure out what wine I’d like with my pasta, as I planned to drink the rosé with the salmon. Pacing myself. Dining Table, Amuse Bouche: duck spring rolls. Once I finally made my agonizing choices, my dining area was prepared. The tray table pulled out to a serious table. It was very wide, and very sturdy. If I had a dining companion, they could have sat across from me to dine. As a sole dinner, the table was ridiculously large. It didn’t feel anything like a tray table! A white tablecloth was laid out, along with salt, pepper, butter, a bread plate, and cutlery. The set up felt like being in a real restaurant for sure. The only downside is that even when pulled as far as it would move, the table was a bit too far away from me. With my seat fully up, I still had to lean forward in order to reach my food. Again, in terms of actual usability, Cathay wins this one, but the table really was nice. Soon after my table was set, an amuse bouche arrived. What? 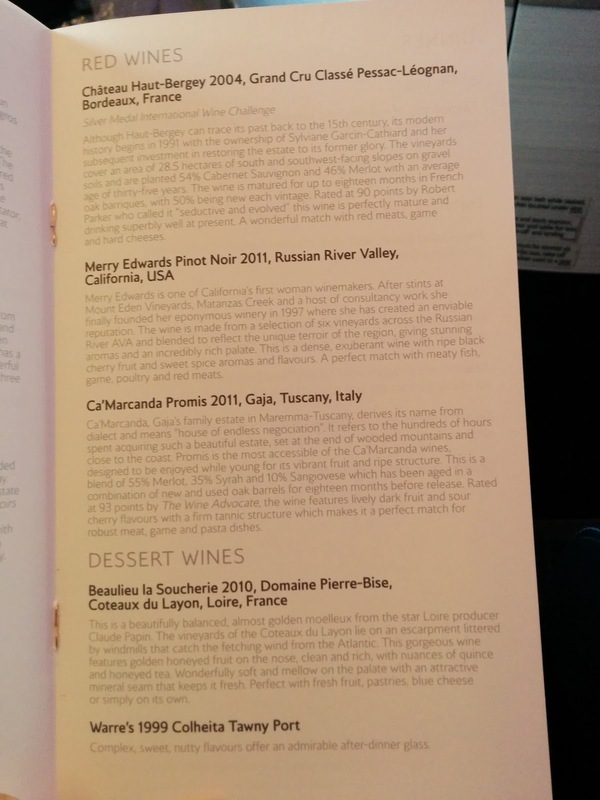 There was an amuse bouche on the plane? 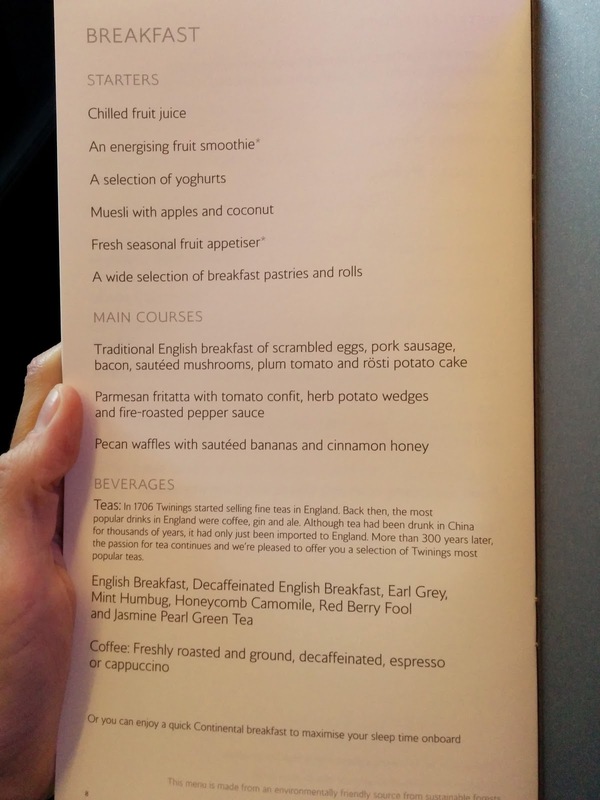 Sure, Cathay had one too, but that was a tiny little bite, served before takeoff even. This was a full on appetizer, duck spring rolls, with hoisen sauce. I would have never ordered these since I don’t like duck, but, I do like a good spring roll. They seemed as fresh as any I’ve had at Asian restaurants, which was a bit surprising, as they clearly had to have been prepared in advance. The rice paper wasn’t dried out or gummy, the shredded carrot and cucumber inside were crisp. The duck shreds tasted like … duck, so I didn’t like that part. The hoisen sauce however was so delicious, and the other components so fresh tasting, that I just picked out the duck and gladly ate the veggie spring roll. I liked this, but obviously wish it didn’t have the duck, and was shocked by the quality of this amuse bouche. It made me really look forward to the rest of my meal! My only complaint? Not enough hoisin sauce, as I really wanted to smother my roll in it. Soon after the amuse arrived, a server came by with a bread basket. The basket contained white, wheat, or cranberry rolls. I’m not much of a bread person, and I already had plenty of food coming, but, I couldn’t resist trying the cranberry roll. Of course, had I known it was sourdough, I certainly would not have done so. The rolls were served warm, but it was a bit gummy, and stale tasting. And, sourdough, which I hate. But even if it wasn’t sourdough, it was not good. I’d skip the bread in the future. I was very impressed when this arrived. No skimpy portions here, each dish in the trio was a sizable portion. At this point I was glad I hadn’t decide to order that ravioli starter in addition, between the amuse bouche and this portion size, I was certainly going to have plenty of food. Plus, you know me, I was eyeing the dessert menu! The three preparations of salmon were accompanied by a lemon wedge, and a caper berry, both very much appreciated, and a slice of garlic bread. I started with the salmon rillette, inside the little bowl. It seemed to be a mix of different levels of cooked/cured-ness, half seemed raw, the other half seemed more cooked. It was good, but the flavor wasn’t that strong, and I found it a bit one dimensional. I desperately wanted a creamy component to go with it. I think I was supposed to spread it on the provided slice of garlic bread. The bread had a generous amount of butter and garlic inside, which was super flavorful, but the bread itself was spongy and not warm. I did end up scraping all the garlic out, it was quite tasty. Garlic and salmon seemed like a strange pairing though. Next, I moved on to what I decided must be the potato salad, as nothing on the plate jumped out at me as "potato salad". It seemed to be the same salmon as the rillette, but layered on top of thinly sliced potatoes, with a cream (crème fraîche perhaps? ), garnished with dill. The potatoes were perfectly cooked, still a bit al dente. I love classic potato salad, and the cook on the potatoes is a crucial part for me, and so many places fail to get this right. I don’t want them mushy, but I don’t want them undercooked and hard either. I like just a bit of bite. And these were perfect. The cream was also fantastic, exactly what was missing from the rillete preparation, and it also complimented the potato perfectly. The dill added a burst of flavor, and I really appreciated the detail of having a tiny little garnish like this. Finally, the Balik-style salmon. It was also good, nice firm, fresh fish, but it didn’t have a whole lot of flavor on its own, and again, I wanted something to go with it. 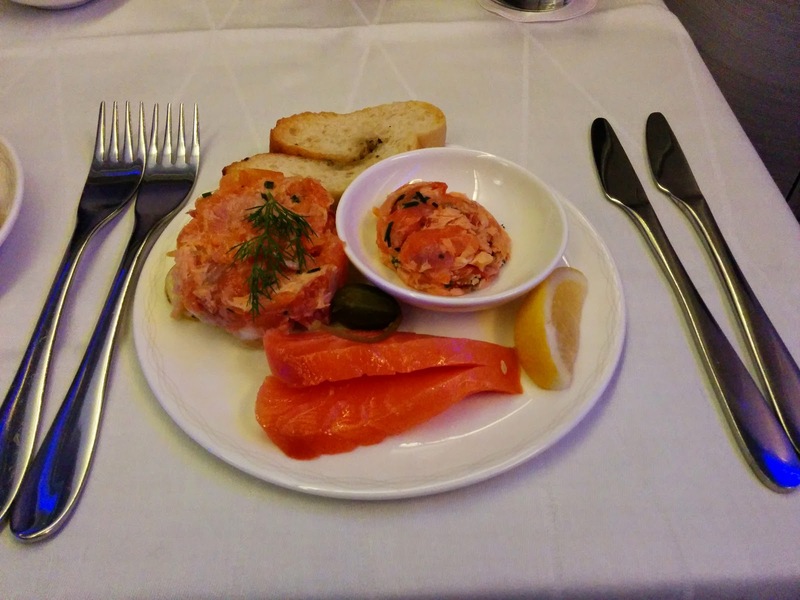 Of course, I also can’t help but compare it to the last salmon I had on a plane, the downright incredible salmon with caviar on Cathay Pacific, which I still think is the best smoked salmon I’ve ever had in my life, not just including on a plane. Overall, this was a very impressive dish, particularly the quantities, and I loved that they composed it as a trio, fine dining style. The potato salad was hands down my favorite, and I’d gladly order it again. The Batik-style was my second favorite, followed by the rillette, as it was just a bit too plain for me. Main Dish: Chanterelle Mushroom Cannellini. Soon after came my main dish, the one I picked from the bistro selection rather than the main menu, described as “chanterelle mushroom cannellini with blistered tomato, caramelised chanterelle mushroom and smoked aubergine cream”. Served on the side was a little dish of parmesan cheese that I could sprinkle on as I desired. I was momentarily surprised when the dish arrived, and realized that I’d mistakenly read “cannellini” as “cannelloni”, and I was expecting long filled tubes of pasta, not ravioli shaped. I’m not entirely sure what was inside the ravioli, I think there was mushroom and standard ricotta, but I really did not care for the filling. It was mushy, and just tasted weird. The ravioli themselves were cooked ok, and I liked the bit of al dente bite to the edges. On top was a very thick sauce, “smoked aubergine cream”. It wasn’t really what I’d call a “cream”, but it had a fantastic smokey flavor, and I really liked it. It made me wish I wanted bread, so I’d have something to use it on. Instead, I resorted to using the edges of the ravioli. The aubergine cream could have stood alone as a soup too, and would have been good that way. Also included were a bunch of mushrooms on top, not caramelized as advertised, but a bit meaty, decently cooked, and very flavorful. They went well with the aubergine cream. There was also a single blistered tomato, which made me laugh a bit. It was also nicely cooked. I somehow expected the sauce to actually have the tomato incorporated into it, but that was just me making the assumption that pasta dishes should always have a marinara sauce. Or at least that there would be more than one tomato. But, when I re-read the description, I saw that this was exactly as advertised, "with blistered tomato", singular. Overall, this dish reminded me of the ravioli I had on Virgin America, where I liked the edges, and not the filling. 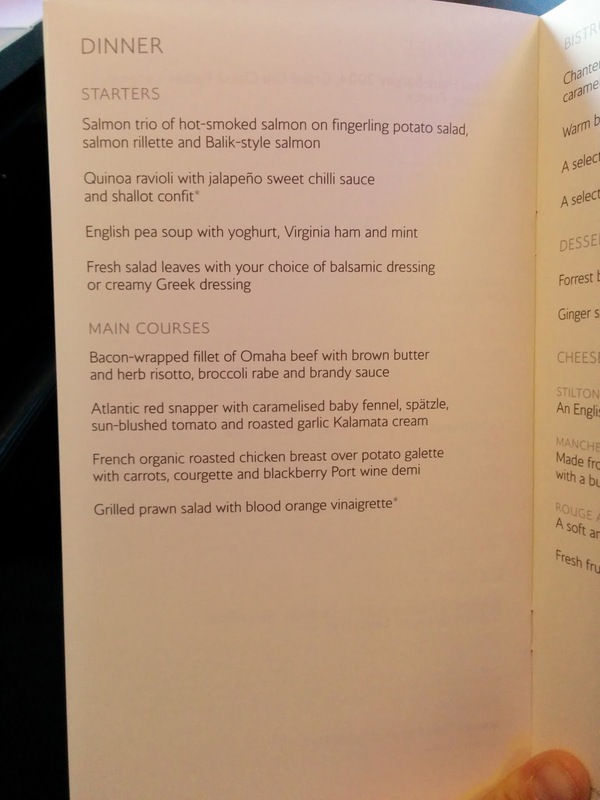 It also just didn’t seem first class quality, which, somewhat makes sense, as it came from the bistro menu, not the full dinner menu. The gnocchi from American Airlines still remains the best pasta I’ve had on a plane. I was having serious buyer’s remorse at this point for choosing the pasta, since it wasn’t remarkable, and I’d been so close to ordering the snapper. Emil however did order the snapper, but was very disappointed with it. He took one bite, and actually sent it back, saying it was inedible. Emil is normally a very polite guy, and even if he doesn’t like something, he’ll try a few bites, smile, and say it was fine. Here he clearly expressed his displeasure. It truly must have been awful. He later told me it was the worst cooked fish he ever had aboard BA. I guess I didn’t make the worse choice, although, I did wish I got a chance to try the spätzle on his. The pasta came very soon after my starter dish was cleared, and I was planning to order wine to go with it, but my dish arrived before I had a chance. This was a bit unfortunate, as I had to order after the pasta arrived, and had to interrupt my eating of the hot dish with some wine tasting. I generally liked pinos, so I was going to pick the Merry Edwards Pinot Noir, but Emil suggested the Bordeaux, as he said he thought I’d like it. He knows my taste in wine very well, so I was going to take his suggestion, but still hesitated, so he encouraged me to ask to just try them both. The server gladly obliged, giving me a small pour of both. In the end, Emil was right, I liked the bordeaux more than the pinot, as the pinot was a bit too tannic for me. The bordeaux was full bodied, but still a lighter style, plenty of flavor but not overwhelming. A good pick. Dinner Menu: Bistro Selections, Dessert, Cheese. I never pick fruit or cheese, so those were easy to rule out. I wouldn’t normally even give the ginger sponge a second though, but the server told me that it was served warm, with ice cream. You know what a sucker I am for warm desserts with cold ice cream! But, of these choice, the forrest berry tart sounded most interesting, even though I wasn’t certain exactly what “forest berries” were. Of course, Emil, on the other side of the cabin, calls out that I should order both. The attendant would have been quite happy to oblige, and suggested it several times herself. I was pretty stuffed at this point though, and I knew there were a slew of items I wanted from the breakfast menu in about 6 hours, so, I used restraint, and ordered only the forrest berry tart. A few minutes later, I was surprised when the attendant returned, two desserts in hand. Except neither looked like a forrest berry tart, nor a ginger sponge, and no ice cream was in sight. I was confused. She explained to me that one was a tart, but it didn’t look forrest berry to her, so she and the other person in the galley had cut one open, and indeed, no berries inside. They taste tested it, and it was lemon, not berry. So, she offered that instead, telling me the whole story. I was impressed that they cared enough to do the investigation, and didn’t just assume the berries were there somewhere. Now, I dislike lemon desserts, but she had no way to know that, yet as I said, she brought a second choice with her, and it wasn’t the ginger sponge and ice cream that I’d earlier ruled out. 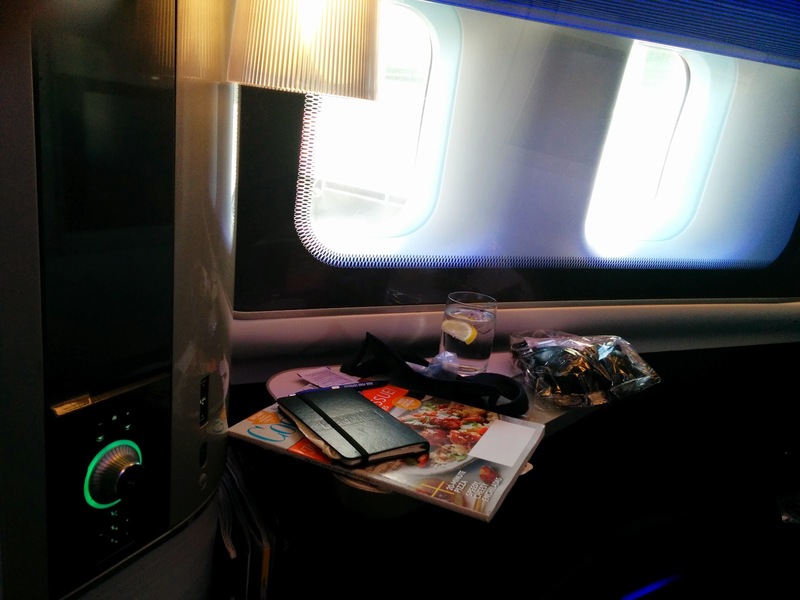 It was the business class offering. She said I could have either, or both, of these choices. 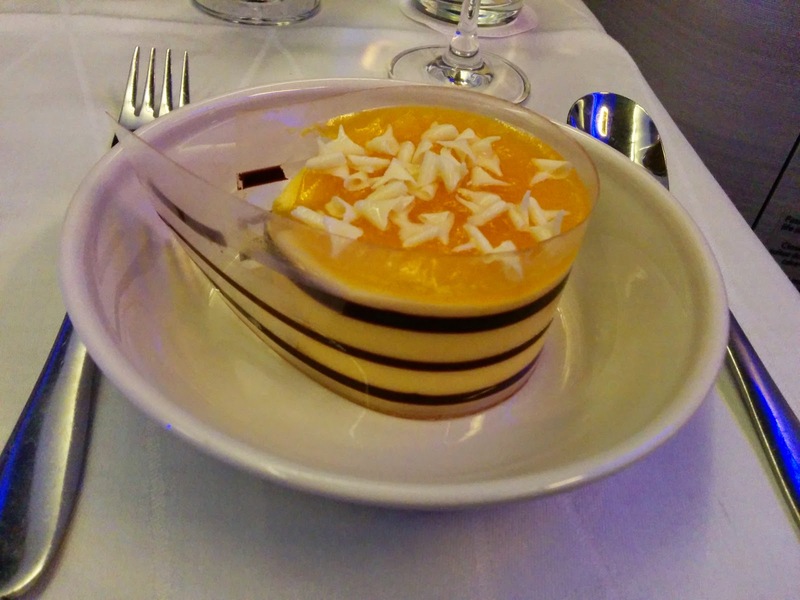 The business class one was a passion fruit and mango mousse, another item I wouldn’t pick, but, it sounded better than the lemon tart, and my sweet tooth did need satisfying, so I went with it. She offered a few more times for me to take both just in case. The mousse was a layered creation. The bottom was a thin plain cake, a bit dry, very boring. I didn’t like this component, and only tried a few bites of it. Atop that was a very light and fluffy passionfruit mousse. I appreciated the consistency and lightness of it, but I didn’t love the flavor. As I said, I wouldn’t have ordered this, and the reason is that I tend to dislike passionfruit desserts. Not that I dislike passionfruit, in fact, I quite like fresh passionfruit, but passionfruit desserts always taste fake to me. Above the fluffy mousse was a thin layer of mango glee and white chocolate shavings. I liked the contrasting crunch from the shavings. On the outside were thin chocolate ribbons, that didn’t extend into the dessert at all. This dessert was quite pretty, with nice layers and garnishes, although it was given to me with the plastic wrapper still on it. 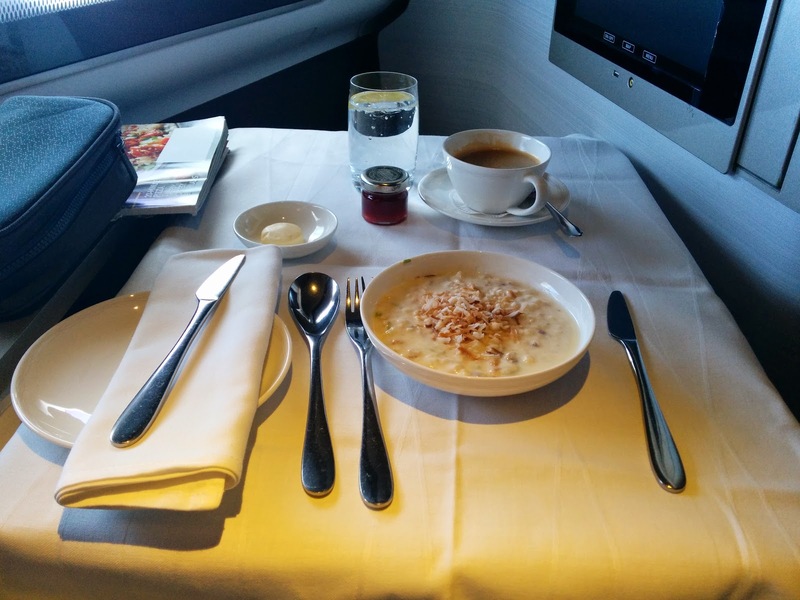 I’m guessing this is because the attendant is not used to serving this dessert, as I said, it came from business class. Overall, it was sweet, and light, and looked good, but wasn’t something I’d get again. I finished all but the cake layer, so it wasn’t bad, just not something I’d pick, which I kinda knew when I ordered it. To go along with my dessert, there were two dessert wines offered, Beaulieu La Soucherie 2010, or Warre’s 1999 Colheita Tawny Port. I’d normally pick the port, but the description of the Soucherie said that it paired well with pastries and fruit, and since I thought I was getting the berry tart, this seemed like the right pick. It was super sweet, quite delicious, but paired with the also sweet mango mousse, it was a bit much. I just finished it separately afterwards. 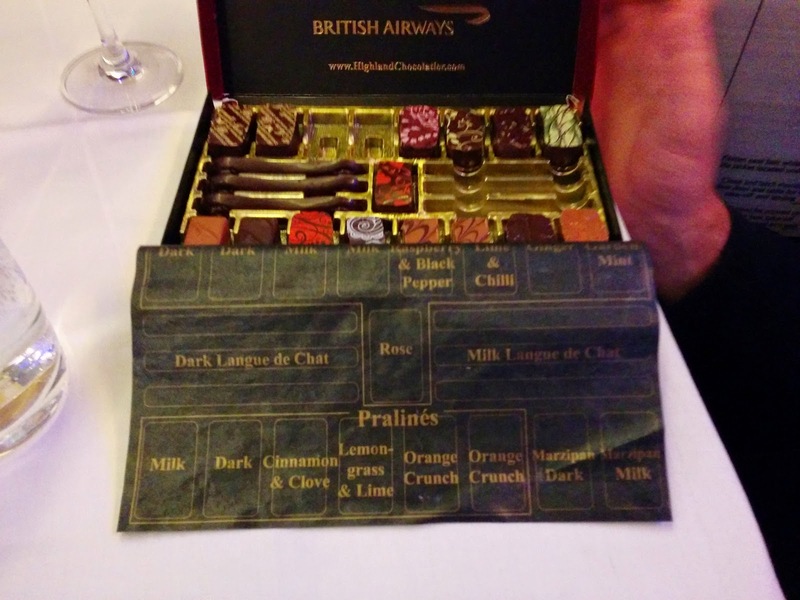 Just when I thought I was done, the attendant came back with one more sweet offering: an entire box of chocolates, packaged specifically for BA, made by Highland Chocolates. She offered the box, and as I took a moment to pick one, she just set it down on my table, and encouraged me to take as long as I needed, and to pick as many as I wanted. Marzipan Dark Praline: “Pure German marzipan dipped". This one was made with a dark chocolate shell, and marzipan inside. For some reason, I really didn’t care for it, the constancy of the marzipan was just a bit strange. Garden Mint Truffle: “A refreshing infusion of garden mint”. Milk chocolate, slightly minty center. I liked the smoothness of the chocolate truffle, but the mint flavor was not very strong. Ginger Truffle: “Nigerian ginger brings out São Tomé’s spicy notes”. Another dark chocolate, this time with a ginger infused truffle center. My favorite of the group, by far. The ginger was refreshing and light, and like the mint truffle, the chocolate was oh so smooth. After all that eating and drinking it was time to check out the rest rooms. The first class cabin contained two bathrooms only, one was slightly larger than the other and contained a window, but both were quite small. The Cathay bathrooms were much larger. The bathroom was equipped with standard amenities: soap, lotion, tissues, and quasi-cloth towels. The sink was a standard airline sink with an push button that turned it on for a set amount of time. It made me again realize how much I appreciated the Cathay sink that had an actual on/off. The first class cabin was 14 seats, and we were only 50% full, and I still found myself waiting to use the bathroom every time I went. I’m not sure if I just had bad timing, or if this ratio just wasn’t right given the fact that we were all operating on a similar schedule. I was a bit nervous when I went to change before landing that I wouldn't have enough time, as I waited a really long time, and I knew the seatbelt sign was about to be turned back on. Once I got up to change into my pajamas, the attendant asked if I’d like my bed made up. By the time I returned, it was all ready for me, laying fully flat. On top of my regular seat was an additional thin mattress pad and a duvet. 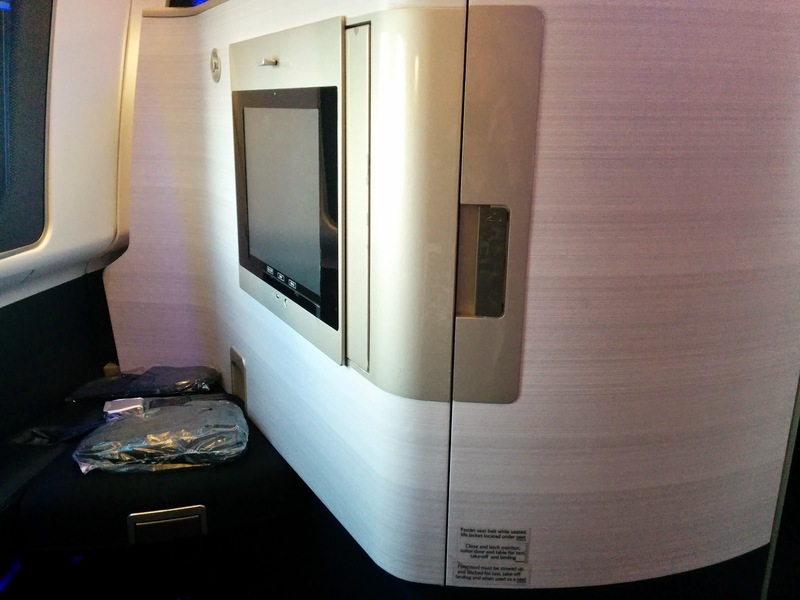 The bed, like the seat, was no where near as wide as the Cathay version. It didn’t bother me at all while seated, since the Cathay one seemed ridiculously large, but while sleeping, I would have preferred a bit more space to turn from side to side. The bed however was quite sturdy. 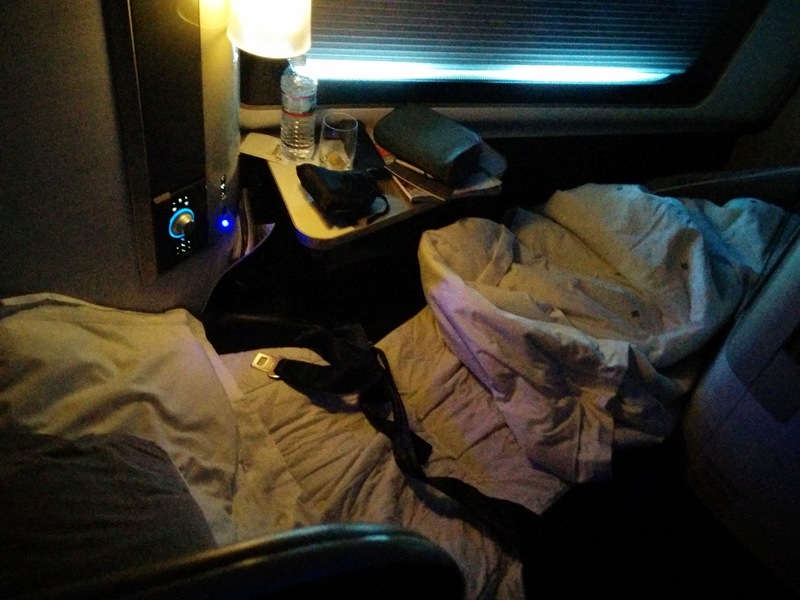 I’m not sure how else to describe it, but unlike any other airline bed, it just felt solid. There were no weird lumps or seams where different parts joined. The duvet was a nice weight, and the two pillows were sufficient. However, again, the lack of storage space in the seat was annoying, as I had no where I could safely tuck my glasses and other belongings while I slept, besides on the side table, where they were not secure. While the bed was comfortable, I didn’t manage to sleep. Some of it was timing. The flight departed at 7:45pm, and after dining it was probably 9:30pm or so, and I wasn’t really ready for sleep, as I’d been going to bed around 1am leading up to this (not because I meant to, I just wound up really busy trying to finish things up every night.) But I also knew that the flight was only 10 hours long total, and breakfast would be served 2 hours prior to landing, so if I wanted sleep, I had to do it then. Everyone else in the cabin went to sleep long before me, and I knew they were more experienced travelers than I. Try as I might, I couldn’t sleep. After a few hours, I could hear others ordering breakfast around me ,so I just gave up and got up. An offer was quickly made to turn my bed back into a seat, which magically happened while I went to brush my teeth and put my contacts back in. Strangely, the mattress pad was left behind, although the duvet was taken away. 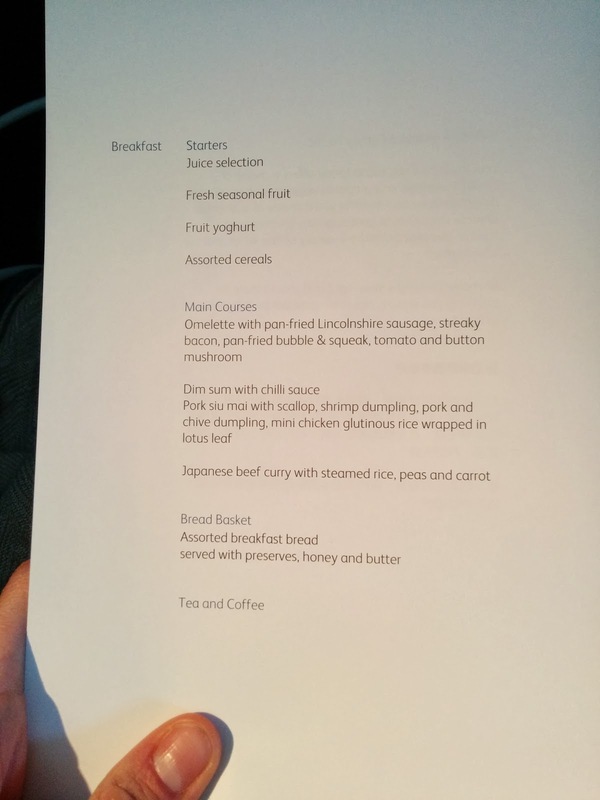 As I mentioned earlier, I was looking forward to the breakfast service, since I’d seen the menu in advance. Emil had advised me that he doesn’t ever eat breakfast on the flight, as to maximize his sleep time. Instead, he eats in the lounge when he arrives in London. Most others seemed to order the continental breakfast, a quick option offered within 45 minutes of landing, again, to maximize sleep. But not me. I wanted a real breakfast! The menu was fairly extensive, with something for everyone. It was easy to have a nice light meal, or go all out decadent. I’m sure you know which route I went. For starters there were a few light fruity options: chilled fruit juice, an “energizing fruit smoothie”, a fresh seasonal fruit platter, or selection of yogurts (plain or fruit). Or muesli with apples and coconut, which is what I picked. Two of the main courses featured eggs, a ridiculous platter of a traditional English breakfast with scrambled eggs, pork sausage, bacon, sautéed mushrooms, plum tomato and rösti potato cake or a Parmesan fritatta with tomato confit, herb potato wedges and fire-roasted pepper sauce. I didn’t want either of these, since I don't really like eggs, but the final option had been calling my name since I first glimpsed at the menu: pecan waffles with sautéed bananas and cinnamon honey. Of course I knew the chances of the waffles being good were slim, but I still went for it. This is exactly my kind of brunch item! A full selection of coffee and teas were available. Breakfast Starter: Muesli, decaf coffee. My table was quickly set again with a white tablecloth, cutlery, butter, jam, and a bread plate. My muesli and coffee arrived soon after. Even though I was crazy tired, I went for a decaf coffee, which was very dark and very strong. I’m still not sure it was decaf, but it wasn’t my style, as I prefer a medium or light roast. Sugar and milk were offered alongside. Now, for the muesli. Let me just start by saying that I adore muesli. Well ok, I haven't actually liked any I've had within the US, but when I lived in Sydney, I fell in love with bircher muesli. I desperately hoped that this would be like Australian muesli. Even on the Qantas flights I took to/from Sydney, the muesli was better than any I’ve had in the US. 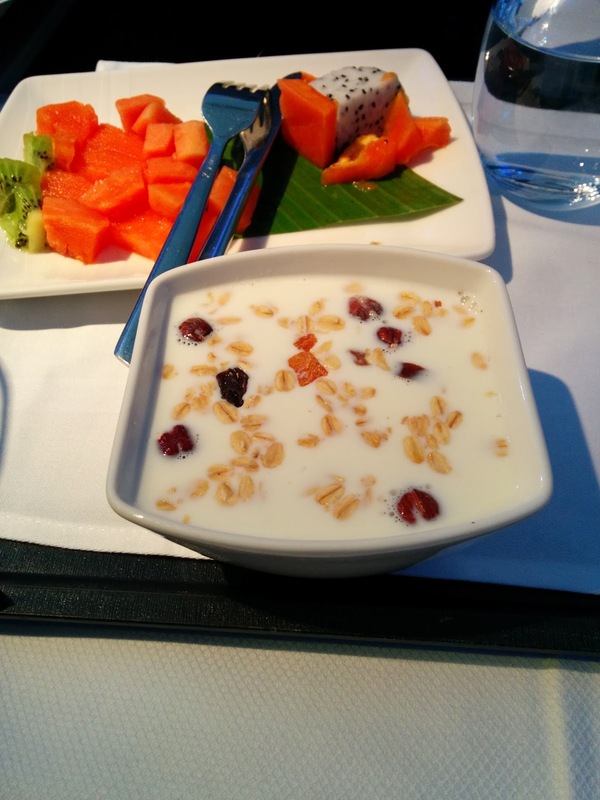 But when I recently flew on Cathay, the muesli was just granola-like cereal, not the stewed version I knew and loved. I had no idea what style this would be. It was much closer to the Australian muesli, as it was soft and clearly had been stewed together with little chunks of apple and plump raisins. However, the base was too strong on the yogurt for my liking. Perhaps it was just the type of yogurt, not my thing. I did love the consistency, and the shredded coconut on top. I wouldn’t get this again, but I imagine this was personal preference. A few minutes after I started my muesli, the breakfast bread service began. Just like with dinner, I was presented with a basket of assorted bread choices, all warm. This time there were croissants, toast, more of the same cranberry rolls, and danishes. 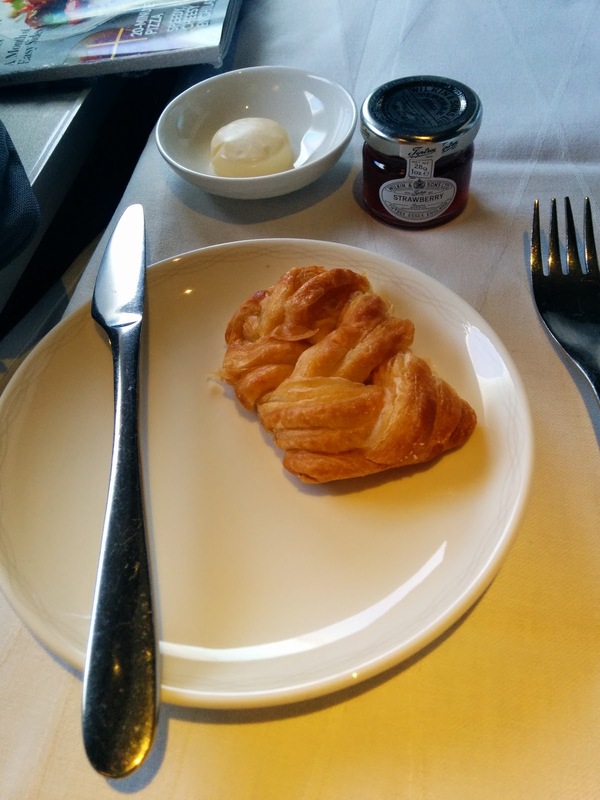 None looked particularly good, but, I can’t ever resist breakfast pastries, so I selected the danish, not having any idea what kind it was. Inside was a sweet cheese, which was ok, but not remarkable. The pastry itself however was as bad as it looked, not flaky, clearly not fresh. At least it was warm? I certainly wouldn’t get this again, and didn’t bother finish it. The little jar of jam it was served with was decent quality strawberry jam by Wilkin & Son, which I’d see again on a later flight with my scones, but didn't make sense with my danish. Around this time, my coffee ran out. I knew I wanted a hot beverage to go with my upcoming waffles, but I really didn’t like the coffee, so I wasn’t eager for another. 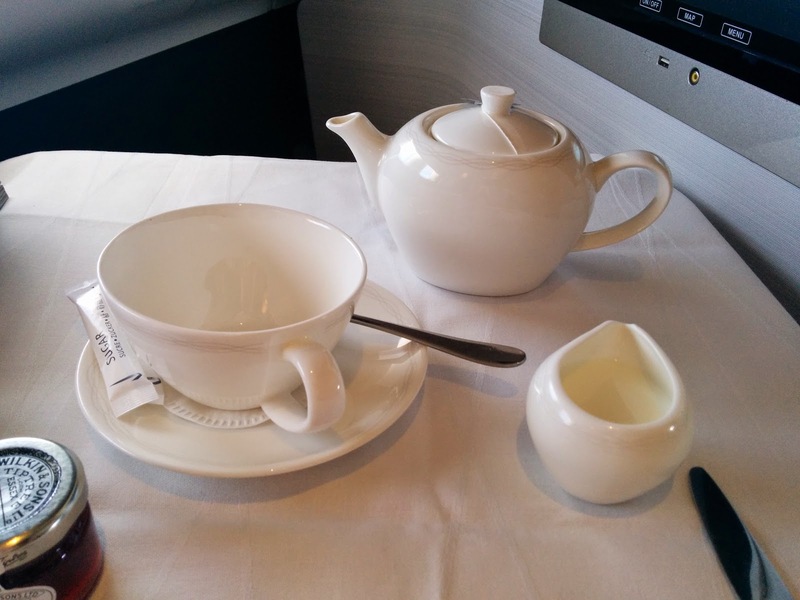 I noticed that everyone else around me had ordered pots of tea, Emil included, even though he wasn’t having breakfast. Not to stereotype, but, the British are known for their tea, so … I decided to get a pot, even though I don’t normally drink much tea. The selection was all by Twinings, and contained several black teas, some herbals. Of course I picked the English Breakfast. The presentation was as cute as you would expect, a full pot, served with a little pitcher of milk, and sugar packets on the side. The tea was excellent, perfect with milk and sugar. The British know how to do tea, that is for sure. I wish that they had Splenda, since I was having so much sugar in my waffles, but they only had regular sugar. Pecan waffles with sautéed bananas and cinnamon honey. And finally … the waffles! Now, I knew I was ordering waffles on a plane. When I had told my mom I was excited for breakfast and for waffles in particular, she scoffed at me, saying “Julie, you are going to be on an airplane - the waffles will not be good”. And, she had a point. My cafe at work makes fresh waffles daily, and I stopped eating them long ago, as they are never as good as I want them to be. I have specific desires for waffles: crispy outside, moist inside, interesting flavor, and decadent toppings. Surely, there was no way these would be good. The description said “pecan waffles with sautéed bananas and cinnamon honey”. 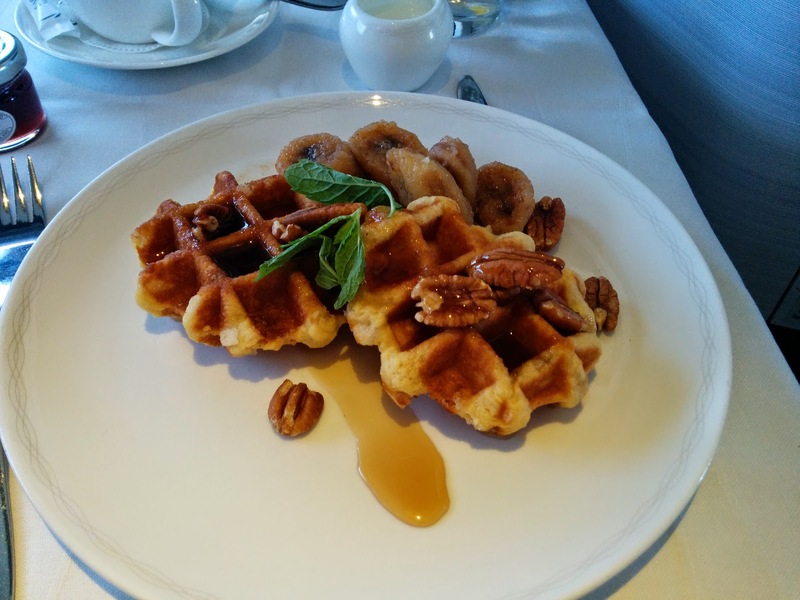 I didn’t know quite what to expect, but I assumed the pecan would be in the waffle batter, that they’d look like thin soggy Eggos, and have some warm bananas on the side, perhaps drizzled with honey. I also just assumed there would be a pot of syrup, even though it wasn’t mentioned, because, well, don’t waffles always need syrup? I was a bit wrong in my expectations, in all ways. First, the waffles didn’t look anything like a thin, flimsy Eggo. My plate had two waffles, both super crispy. And, even better, a bit caramelized on the outside. The pecans were not inside the batter, but rather a garnish on top, a scattering of pecan halves. While the base flavor of the waffle wasn’t anything remarkable, they really win for the texture. How they made waffles actually crispy and not soggy and moist from being microwaved on a plane I have no idea. I was shocked. I was also wrong to expect a pot of syrup. Rather, the waffles were drizzled with the honey. I didn’t taste cinnamon, but it was sweet and sticky, and even though the whole thing was a sweet overload, I couldn’t help by use my waffles to soak up every last drop of the honey sauce. I would have preferred it on the side though so I could add it as I wanted, rather than having some pieces really coated in syrup, and others not at all. The bananas were the only disappointment on the plate, a pile of soggy, lukewarm, mushy, bananas. Overall, this was actually quite good, and I shocked myself by finishing the plate in record time. I’d certainly order this again, for breakfast, or, even for dessert, as it did outshine the desserts the night before. It was worth waking up for.